Jen Liu is a visual artist working in performance, video, painting, and installation. She studied at the California Institute of the Arts and at De Ateliers in Amsterdam. She has presented work at The Sculpture Center, On Stellar Rays, and Issue Project Room, New York; the Aspen Museum of Art; Henry Art Gallery, Seattle; MUSAC, Leon; Royal Academy and ICA in London; Kunsthaus Zurich; and Kunsthalle Wien, Vienna. In 2013 Liu's installation Melon Mysticism for Everyone, was affixed to the Manhattan Bridge in New York. She was included in the 2014 Shanghai Biennial. Liu lives and works in New York. 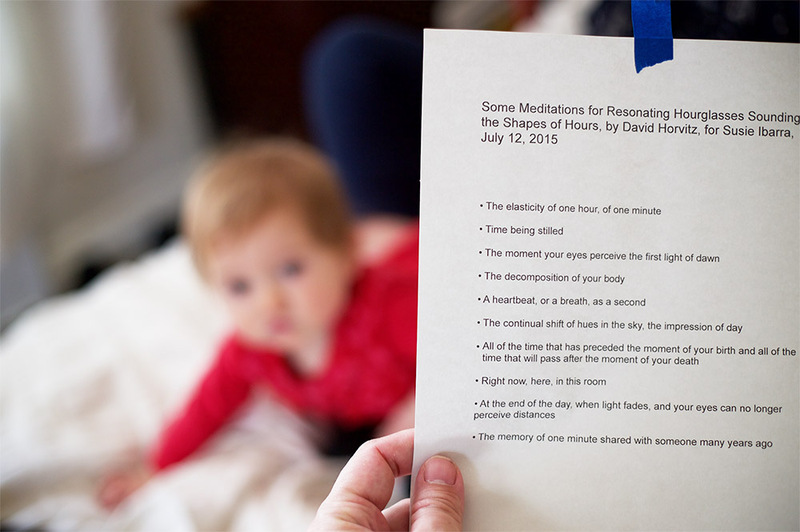 David Horvitz is a half-Japanese Californian artist who was born in Los Angeles. He has recently had solo exhibitions at Chert, Berlin; Yvon Lambert Librarie, Paris; Fotomuseum Winterthur, Switzerland; Blum & Poe, Los Angeles; the New Museum, New York; Jan Mot, Brussels; Dawid Radziszewski Gallery, Warsaw; Statements, Art Basel; and Kunsthal Charlottenborg, Copenhagen. Susie Ibarra is a composer, percussionist, and educator who creates live and immersive music that explores rhythm, indigenous practices, and interactions with the natural world. She is cofounder of the digital music company Song of the Bird King, which emphasizes the cultural preservation of indigenous music and its ecology. Ibarra’s recent work includes Circadian Rhythms, commissioned by Experimental Media and Performing Arts Center at Rensselaer Polytechnic Institute in Troy, New York, and We Float, commissioned by the Ecstatic Music Festival in New York. Ibarra is a faculty member at Bennington College, where she teaches percussion and performance at the Center for Advancement in Public Action. A recording of Jen Liu’s The Red Detachment of Women, a performance that mines the standardized movements of women’s bodies in Chinese propaganda ballets of the Cultural Revolution and of workers in contemporary meatpacking plants. Video produced by Jessica Lee. An instrument forged from hourglasses, played so as to make time resonate, bend, recur. Video and a score that evokes unmeasurable moments. An instrument forged from hourglasses, played so as to make time resonate, bend, recur. Audio that evokes unmeasurable moments. “What you see on the screen is a series of test patterns and calibration charts to be used while projecting film,” Lucy Raven began. “Before the audience members take their seats, the projectionist runs one of these charts on a loop in the empty theater. The loop is printed with an identical pattern on every frame, so a still image seems to appear on the screen. The projectionist makes a quantitative analysis of the image, checking for correct color, resolution, focus, and aspect ratio, while making corresponding adjustments to the projector, until the image is as perfect as possible.” In narrating episodes from the history of the standardization of filmic images, Raven connected forms of production initiated half a century ago by the United States military and today’s efforts to regulate the appearance of movies cobbled together by technicians around the world. As standards for the projection of film and video change in concert with the technologies that they regulate, they end up shaping (and continually reshaping) our experience of moving images, conditioning us to see. 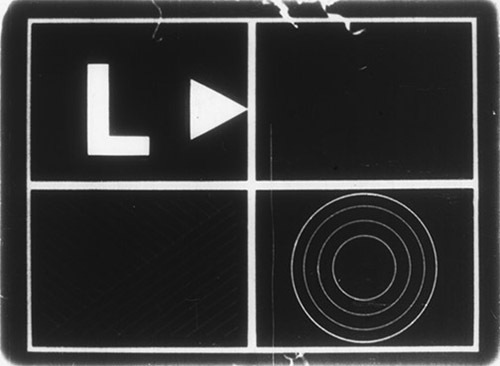 Raven showed numerous calibration charts, which she has collected from current and former film-lab technicians and projectionists around the country; she described them as “the ultimate formalist films,” each being designed “with only the technical characteristics of the medium in mind.” One such chart is RP 27.4, known as Freedom from Travel Ghost. (RP stands for Recommended Practices.) 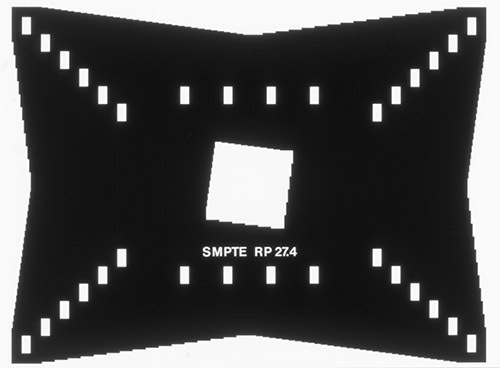 RP 27.4 helps to detect “travel ghost,” which occurs when the projector’s shutter blade is improperly adjusted and the image appears blurred, partially imprinted with the preceding frame. 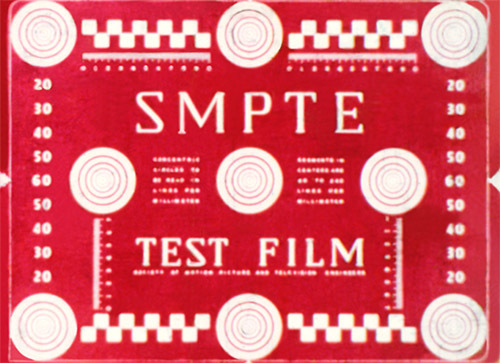 The Academy of Motion Picture Arts and Sciences has sporadically released test films that use naturalistic images and film clips rather than purely technical images to test projectors. Raven showed some of these films, which, she observed, often contain incidental narratives, even meditations on the nature of the screen test. Today’s movie industry has largely switched from celluloid to digital projection. Most digital projectors now have test patterns embedded directly into the machine, to be retrieved at the push of a button. In 2015, the Academy introduced the Academy Color Encoding System (ACES), which is meant to become “the industry standard for managing color throughout the life cycle of a motion picture or television production.” Raven described ACES as proposing not just a unifying standard across the entire “life cycle” but also a cohesive, singular way of seeing—indeed, a world in which “everyone shares the same vision,” as the narrator of the promotional video below intones—at a time when film production is more globalized and fragmented than ever. As Raven’s work Curtains (2014) details, digital cinema files might be sent from Hollywood to postproduction facilities in China, India, Europe, or Canada for visual-effects and mastering work, which occurs in any of dozens of formats and color-encoding schemes, with important metadata often getting excised along the way. Academy of Motion Picture Arts and Sciences, promotional video for Academy Color Encoding System (ACES), 2015. With Lucy Raven, Jen Liu, David Horvitz & Susie Ibarra July 12, 2015 5:00 p.m.—7:00 p.m. Whitney Museum of American Art $8 adults, $6 students and seniors, free for Whitney Museum members and children under 18. Triple Canopy previews an issue devoted to standards and standardization with performances by artists Lucy Raven, Jen Liu, and David Horvitz with Susie Ibarra. Raven narrates episodes from the history of the standardization of filmic images. She connects forms of production initiated half a century ago by the American military and today’s efforts to regulate the appearance of movies cobbled together by technicians around the world. Liu debuts a performance that mines the standardized movements of women’s bodies in Chinese propaganda ballets of the Cultural Revolution and of workers in contemporary meatpacking plants. Through choreography and animation, Liu asks if the gestures performed by factory workers and butchers might be understood as meaningless repetition or as a passage to social harmony. Horvitz presents a musical instrument made from a number of hourglasses, antique containers for minutes and hours. Percussionist and composer Ibarra uses this instrument to make time resonate, bend, decay, and recur, prompted by Horvitz’s evocation of moments that can more easily be sounded than measured or calendarized. This program is produced in collaboration with the Education Department, Whitney Museum of American Art.